The latest Greylock Eggplant has hit the halls this week. 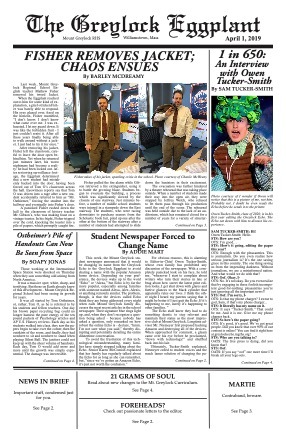 April 1st issue offers four pages of snews, rants, scandal, laughs, and more. Editor Owen Tucker-Smith has assembled an impressive team of writers this year who are working on print editions as well as maintaining an online version of the news (with separate content than the print edition). If you have not seen, subscribed to, or engaged the Echo Online please do. The print edition is only a small part of the work the Echo staff is doing. Here is a link to the online Echo page which you should promptly bookmark in your browser of choice. Note: The online version works brilliantly on your handheld devices as well.